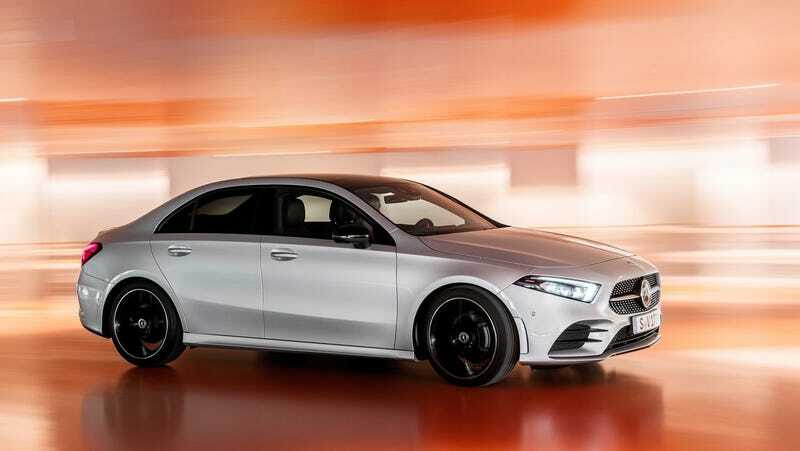 Mercedes-Benz seems to be replacing the saggy CLA model in the U.S. with the first-ever American market Mercedes-Benz A-Class. It looks great, it’s the first to feature some of the automaker’s newest tech and styling, and I had about five minutes on a hotel rooftop last night to check it out. Here’s what I know. 1. Mercedes-Benz’s new double-wide screen infotainment setup is a big improvement. Gone are the days of the floating screen seemingly tacked onto an air vent. Mercedes has already premiered its new super-wide information screen, which stretches from the driver’s information all the way across the dashboard. The A-Class is the first Mercedes model to get an upgraded infotainment setup paired with the new screen, though, as well as a new touchpad that’s much more intuitive than the old wheel dial control. People use laptops all of the time. How often do you use a little bezeled wheel to do anything beyond turn on the shower water? It’s a nice upgrade, and it’s even nicer that it’s in the entry-level car. 2. With the new screen and touchpad, there’s also a new virtual assistant that answers to voice commands. You wake the assistant up by saying, “Hey, Mercedes?” and an elegant British woman’s voice would inquire what it could do for you, which is interesting for a German automaker. However, since the programming seemingly wasn’t actually setup, demands for the nearest McDonalds, pizza, and requests to change climate settings fell to silent virtual ears. Still, should it work on the production car, it’s a neat feature that may actually get some use as long as you don’t bring up the word “Mercedes” frequently in casual conversation inside the car. 3. The A-Class doesn’t pretend it’s a coupe, which means the back seats are actually comfortable. The CLA’s identity crisis as a four-door coupe, and its placement in the small car segment meant that the back seat was tighter than it had any reason to be. Since the new A-Class is more of a “traditional” sedan with a roof that accounts for human heads, it’s much nicer in the back. Leg room is pretty good for a car of this size, with a guy over six foot able to sit just barely without rubbing if the seat in front was setup for his driving position. Some gouging of mass in the back of the front seats helps with this, and the glass roof stops short enough to lend a few more inches of head room. 4. Entry level still means there was a limit on the budget, and it clearly ends below the waist. The interior of the new A-Class is a pleasant-enough place to be, visually and aesthetically. Mercedes’ obsession with that weird mood lighting continues as a standard feature on the A, but the soft materials and fancy finishes end right about waist level. Most of the footwell furnishings, like the lower door panel, glove box door, and center console panel are brittle to touch. The seats are also all manually adjustable, but this could be remedied with an option in the future, we’ll see. It’s not a big deal, but it’s also a big clue as to where in the lineup you’re sitting. At the very least, some softer knee-contact patches would be very welcome for those of us that don’t always stretch out, or for dealing with an aggressive driver. 5. If you can remove a line and it still looks good, remove another line. That was the design philosophy behind the new A-Class, according to the reveal presentation. Mercedes is moving away from the days of unnecessary folds and creases in the design language. Supposedly, this is the direction we’re going to see the automaker continue down in the future, with smoother, simpler bodywork. Do you like it? Bonus: Are the wheels bronze, copper, gold, or rose gold? The majority of my discussion of the A-Class last night, both in person and on Twitter, was sparked when the color of the wheel accent hue was questioned. In the reveal video, and on the car on display last night, the shadow areas of the wheel design were colored. A debate followed about what color it was. Daniel Golson of Car And Driver questioned if it was rose gold, because he seems to like that sort of thing. What followed tested even the strongest of friendships. Ultimately, I settled it with a handy phone camera feature called flash (the drink, and the hand holding it, is not mine). At least, we figured out it’s definitely not rose gold. Could we have asked somebody from Mercedes? Sure. Is it somewhere in a press release? Maybe. Were we all journalists meant to be seriously covering a car reveal? Of course. Did any of us actually want to bother ruining a perfectly good argument with facts? Absolutely not. If you want to know more about the new A-Class, check out our post from last night. It seems like a promising little rival to the Audi A3, and I could see it selling very, very well.